Aubrey Ellis grew up learning to control the physically ravaging and emotionally draining interactions with ghosts who insist upon her assistance, ghosts who always leave tangible evidence of the encounter. As an adult, she’s settled into a position as a real estate columnist that gives her the opportunity to connect with and aid those who have passed on to continue their journey without too much damage to herself. Then she’s sucked into a decades old unsolved murder after new evidence emerges. Her reluctant partnership with fellow journalist Levi St. John takes her in new and unexpected directions, personally and professionally, and she comes fully into herself. Although Spinella is designated a romance writer, I found the romance to be an integral part of a paranormal story and not the focus. She spins a ghost story so enchanting that I looked forward to meeting the ghosts and cheered Aubrey on when she succeeded in convincing Levi of her gift / curse. I love when writers understand human emotions, building character integrity and deepening genre novels. Spinelli is brilliant at laying down the elements that came together later in the story, doing so without distracting from the current scene. The tension builds as the story veers from the apparent guilt of one character to another, and I did not guess the true culprit, even with the hints sprinkled about everywhere. Readers who are intrigued by the possibility of the existence of ghosts and the ability to converse with them will like this story. If you liked the television series Ghost Whisperer, you will love Aubrey’s story. 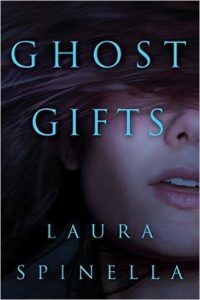 Thank you, Laura Spinella, for gifting me the digital copy of the first Ghost Gifts. I love it! They can’t hurt us, right? They’re the shadows that you see out of the corner of your eye, the shadows you ignore, the shadows you call “floaters” when you hit middle age. It’s true they float, as they haven’t a corporeal body to anchor them. They float. They glide. They whoosh overhead when you look down. They slink close and tickle the hairs on the back of your neck. Many people learn to become blind to them, just as we become blind to seeing our nose so that it’s not a constant distraction. After all, they can’t hurt us.